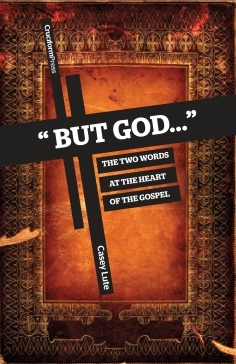 “But God” by Casey Lute is another offering from Cruciform Press. I love what these guys are doing in offering Theologically rich books that are clear, well written, easy to read, and Gospel saturated. These books are small but they pack a huge Theological punch without a lot of Theological ‘jargon’ that may scare some folks off. I can’t recommend these guys highly enough. The same thing can be said for “But God”. Casey Lute does an excellent job of walking us through the Scriptures and pointing out instances of the use of the term, “But God…”. It is amazing that 2 words can mean so much to a story so big, but indeed, you would be hard pressed to find a better summation or description of the ‘Gospel’. These 2 words as they are used in the Scriptures to describe the history of salvation tell us 2 major things: God is different than us, and God is active in the saving of His people. In fact apart from these 2 words, mankind would have no hope, for apart from these 2 words and the God in whom they are pointing us to, there is no salvation. This is not only true in the initial act of salvation, but also in the sustaining of our Christian lives and our persevering in the faith. From beginning to end, our Christian lives are wholly dependent on God. Mr. Lute does an excellent job of unpacking these truths for us.